You have to love the way weather in Arkansas changes drastically on any given day. I think we are firmly set in Summer weather now with the torturous high temperatures combined with high humidity. We don't like it and neither do a number of the plants commonly grow in home gardens. Many of my squash plants have rotated between healthy and hosting powdery mildew from all the humidity. Not to mention the sad rotting of fruit on the vine from the excess water in all of our Spring rains. I've seen other losses with the small storms this past week, including my gorgeous Gladiolus that was only two-thirds bloomed. The winds snapped off the whole flower section, which was as tall as me. It currently sits in a vase in my kitchen so that perhaps it will finish blooming before it dies off completely. My potato plants also suffered in the storm and I may have to dig some of my potatoes early because it does not appear that some of the plants are going to recover. Despite these issues, I have so much food coming out of the garden that I'm already having to give it away. It might help if I stop gleaning fruit from around town and purchasing extra vegetables from the Farmers' Market.... or rather, it's time to get out the jars and begin canning, methinks. I pulled out my trusty Food in Jars book yesterday and made some peach butter (so much better than apple butter!). As soon as my mustard seed arrives, I'll begin making pickled vegetables. So excited to try pickled zucchini and green beans, you guys. I really hope that they turn out awesome so I can share those recipes with you. In case you are interested in storing local food like I am, the online Farmers' Market currently has gallon options for blueberries and blackberries. I splurged last week and bought a gallon of blueberries, a decision I do not regret. I froze half the blueberries and ate the other half in various ways. If you'd rather spend time than money on such a venture, there are many wild blackberries fruiting at the moment. I have an awesomely huge patch right down the road and have collected two quarts of blackberries recently. They aren't as big as the blackberries you can get from the store, and they have more seeds, but they are just as tasty in my opinion. Plus, it helps that they are free. First sunflower is blooming at my house! So far, Wayne and I have harvested eighteen (18) pounds of produce from our garden. Most of which was Italian Green Beans at a whopping nine and a half (9.5) pounds. Closely seconded by zucchini and yellow squash (from one plant each) at two point nine (2.9) pounds each. I have gotten to collect a few ripe tomatoes of the smaller variety, but am still waiting on the larger ones to ripen. I very much hope that I won't have to make only green tomato salsa this summer....but you never know what mother nature feels like throwing at you. I have recently discovered what much of the ugliness I am facing in my tomatoes are caused by. One of my tomatoes has been infected with Tobacco Mosaic Virus, which can be spread by people smoking and then handling the tomatoes. Very unfortunate that I didn't know this previously because there are smokers around my garden often and it could kill the plant. As an added bonus, there is no cure or deterrent for the virus in non-disease resistant cultivars. Home gardens can produce oddly shaped produce. Many of my tomatoes are also suffering from early blight. This causes yellowing of the leaves and brown spots that form in a circular pattern. This early blight is a symptom of all the rain combined with the humidity and heat conditions we have been experiencing lately. It can also be cause by overhead watering combined with the Arkansas heat, so if you are watering your garden using this method, it might be better to water at the base of the plant, even though it takes longer. For my plants, overcrowding might also have caused this issue. Next year, I will not be using the square foot gardening method with tomatoes, especially the bushy varieties that I have in the garden currently. One of the Master Gardeners informed me yesterday that one way to control the spread of diseases is by applying liquid copper solution to the plants. This is an organic fungicide that won't cure the disease but will hopefully stop it from damaging all of your tomato plants. It is also recommended that you remove any infected leaves as soon as they are noticed. Be sure to thoroughly wash your hands with soap and water before touching any other plant. I have also found Tobacco Horn Worms in both my garden and one of my worksite gardens. Though this worm is beautiful, he can decimate a plant very quickly. The one I discovered in my garden yesterday had eaten half of the top foliage on my orchid pepper. Chickens unfortunately won't eat this worm so you will need to kill it yourself and discard the body. If you let it go anywhere near your home, he will find his way back. I tried feeding a live one to the chickens yesterday and found him on the side of the garden closest to them munching my tomato plants this morning. I dislike killing bugs, but this one had to go. Lacewing eggs, how cool are they? Besides these issues, my garden is faring rather well. The aphid population has greatly increased lately. I can only assume it because of the increase in ladybug and lacewing population. 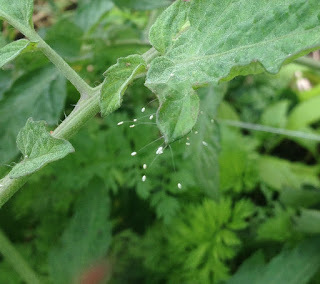 Speaking of lacewings, check out the awesome eggs they leave on plants! If you see these in your garden, just smile and leave them alone. They are our friends since they eat aphids, cabbage worms, and white flies. Mother Earth News actually suggests that you can spray a light solution of sugar and water (1 tablespoon of sugar per cup of water) on plants with aphid problems in order to capture the attention of more lacewings and ladybugs. I didn't have to try this, but I will next time my infestation gets as bad as it did two weeks ago. Looking at the weather forecast for the week, I am very unhappy to see a 40-60% chance of thunderstorms every day. It's hard enough to keep weeds out of my garden without all this rain feeding them! If the rain holds off until around 7pm as it is supposed to tonight, I won't mind nearly as much, though. Saves me from having to water my garden. ;) Hope you all are enjoying what sunshine we are able to get in between all this Spring Shower weather. I have a few new tips for you this month. Namely, if you haven't had the chance to plant a garden yet, it's not too late! Give our amazing climate in central Arkansas, I saw summer plants producing until October last year. At this point, I definitely recommend buying plants rather than seeds if you want a good harvest from your produce. ABC Greenhouse is having an end-of-season sale through Tuesday at 10pm on Conway Locally Grown. There are also still plants available at the Conway Farmer's Market, which is having it's grand opening this Saturday, May 30th. Located at 150 Amity Rd, the market is open from 7am-12pm (I'll be at the Cooperative Ext booth this weekend so come say hi!). Or, if you live in the surrounding area, looks like there are still plants available at the Wooster Farmers Market as well. At least grab a tomato plant and transplant it to a 5-gallon bucket. There is nothing better than a fresh from the plant ripe tomato in mid-summer (well, except maybe a freshly picked tree ripened peach...). First of many summer squash. At this size, they are a sweet treat. I was very excited to catch a few bees in my garden this morning as well. I assumed there were some buzzing around since I have baby tomatoes and squash in the garden, but I hadn't seen them until this morning. According to the FoodTank Newsletter I received this morning, beekeepers are losing 30% of honeybee colonies during an average winter. Being able to provide food and shelter for local bees could help to increase their population size, if only marginally. I plan to put up my insect hotel (mentioned in this post) in the next few weeks, hopefully allowing the critters to make a home for next winter. My garden is full of a diverse selection of plants, most of which are heirloom and endangered varieties that I purchased from Seed Savers Exchange. I have so many plants in my plot that I have run out of space to put anything else. I must say that this is quite a new experience for me. Companion planting and using square foot gardening in my beds has led to a lot of plants in a small space, all of which seem to be thriving (well, except for the corn that I planted under a tree I thought was dead, but is very much alive...). I cannot wait to record my yields this summer to show you how much food you can grow in 1200 sq ft of space in our climate. Thanks to this wet spring, I have had minimal amounts of water input into the garden, but a bit more weeding time. Lots of henbit in this bed with my Brussels Sprouts. I'm sure there are organic options for decreasing the amount of weeds in the garden, but I prefer my current method. I put down a mulch of straw (a little later than I should have), which keeps out a lot of the weeds. I have also opted to keep the henbit and clover as a living mulch in my beds. I once heard that nature doesn't like a vacuum and will do it's best to fill it; the intense ability of weeds to grow in any open space is testament to that. 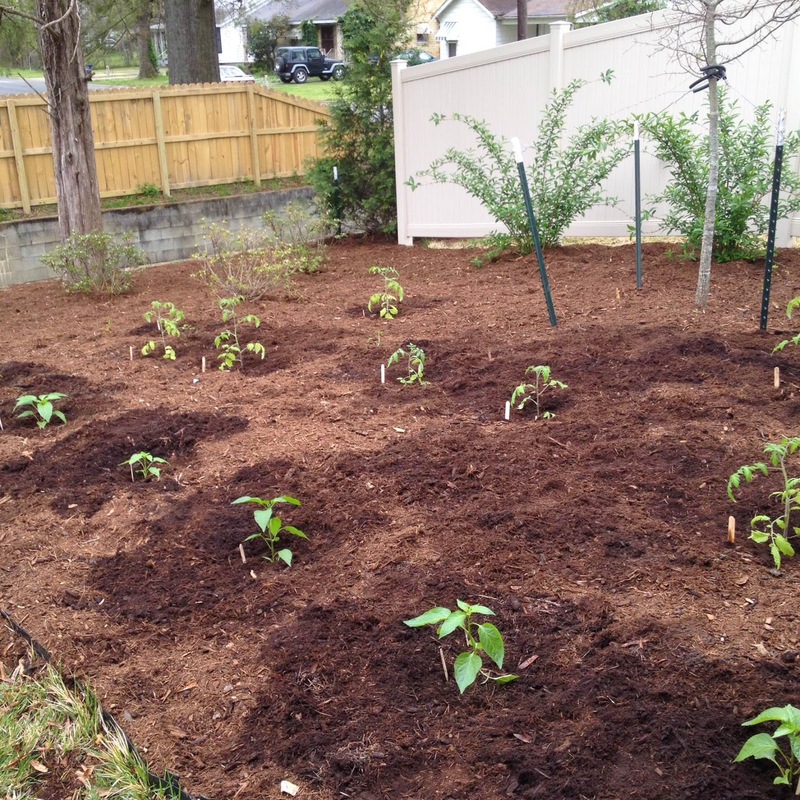 I'm sure a number of you and those you know think of gardens as pristine beds that have bare ground and only your edible plants visible, however, that bare ground leaves your soil open to degradation from rain and air erosion. It also causes the soil to dry out much quicker and isn't hospitable to the bugs you need to create a healthy soil. So, I recommend letting ground covers (plants that only grow about 30cm tall) grow if they pop up. Most will also flower and attract more beneficial insects to your plot. One of my favorite ground covers is the 300 species of clover which actually help to fix nitrogen in your soil. Heavy feeding plants like tomatoes need a lot of nitrogen and greatly benefit from this ground cover. My okra is companion planted with squash. I've also left a lot of clover as ground cover. Or, if you want to create a super intensive garden, you can plant edible ground covers with your taller plants. Mother Earth News has an excellent companion planting guide, which you can find here. It describes which plants help each other while growing. A very old companion planting is the three sisters which I have mentioned before. Since I am growing corn in my garden, I am actually trying to follow the three sisters planting pattern by planting beans around my corn and squash in between the rows. I cannot wait to see the amount of food that comes out of that small section of my garden plot. I have heard that specific varieties work better and so am experimenting with two different legumes (Hatshida beans and sugar snap peas) and both yellow squash and zucchini. My whole garden this summer is a giant experiment and it makes me happy, haha. Please let me know if you have any specific questions about gardening in Conway, AR. I may not know the answer, but I have a lot of resources to help me find the answer for you. I hope you all have a wonderful Memorial Day. If you have any interest in gardening, I recommend you spend an hour or two working in your garden today. One of the clients I work with in my nutrition and gardening classes told me that gardening has been very therapeutic for her and always improves her mood. I feel the same way and hope that it can be a stress-relieving activity for you as well. Tiniest green beans, can't wait to eat them! Several exciting tips for you all today. Starting off, I am sure you have noticed one of the many bamboo forests around Conway. I learned a couple years ago that you can actually eat the bamboo sprouts, this being the part of the bamboo that you find canned in grocery stores. At the time, I wasn't willing to dig them up and try it. Yesterday, however, I cut off two bamboo shoots from the forest near my house where I was harvesting some downed bamboo for the gardens. I took them home, followed internet instructions on cutting them open and pulling out the tender inner area (found here). Then I boiled it for seven (7) minutes and then added it to my stir fry. Tasted just like all the other bamboo shoots I've eaten in my life. Pretty tasty stuff and completely free! I definitely recommend that you try it. Secondly, for those of you that have very little space in/around your homes, I found a super adorable new gardening idea for you. 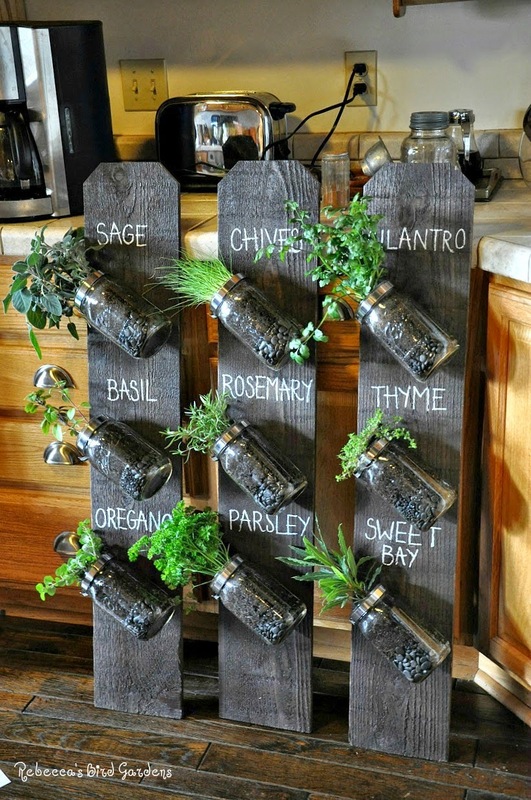 Mason jar herb gardens. You can find the post I read here. All you need is a sunny area to place the jars, some mason jars, some soil, and some seeds. Or you could go all out and put them on their own fancy boards like this inspiring lady did. A small update from the online Farmer's Market: Grass Roots Farmer's Cooperative is up and running, so we have several new options for chicken on the market (no more just whole chickens!). 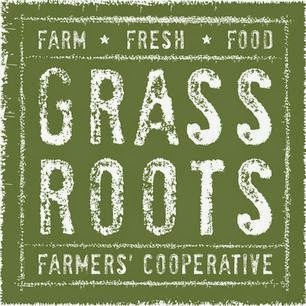 For those of you who haven't heard anything about the Grass Roots Farmer's Cooperative, it is a collection of eight meat producing farmers in Arkansas who are raising their livestock according to the same sustainable, healthy standards and sharing the business side of farming, such as accounting, purchasing, and processing. This means the eight farms gather all of their livestock together and take them to a butcher, hopefully receiving a bulk discount. What it means for us consumers is that we have options like just chicken breasts, just thighs, and just drumsticks for easier preparation in our kitchens. It also means that the farmers have the opportunity to provide to more restaurants and other businesses because they have a larger product selection together than they did individually. I hope this turns out to be a profitable transition for these farms. Though, I think I'll stick to the whole chickens; I do like my fresh chicken stock, after all. I hope you all are getting inspired and planting your own gardens, now is the best time of year to get those summer veggies in the ground. Let me know if you want some help and I'll join you! Wow, April is already here. It is so exciting to see all of the beautiful new green growth. I've been spending a lot of time in my own garden and I still feel like I have so much time to waste on frivolous activities. I adore having the sun out for so much longer. Just a few updates on the professional front. I am no longer a service member with the NLR Community Farm. Turns out that working with high school students is not my forte. I am now serving in Conway (hallelujah) with the Faulkner County Extension Services. In case you didn't realize, because I know I didn't, the Ext. Services does a lot of cool things for our community. Currently, they work with Greenbrier Eastside Elementary School and Wooster Elementary School to teach nutrition classes to the fourth grade students along with planting a garden with them. These are some smart kids, folks. The office is also working on a garden for Independent Living Services; these are some of the most enthusiastic gardeners I have ever met. 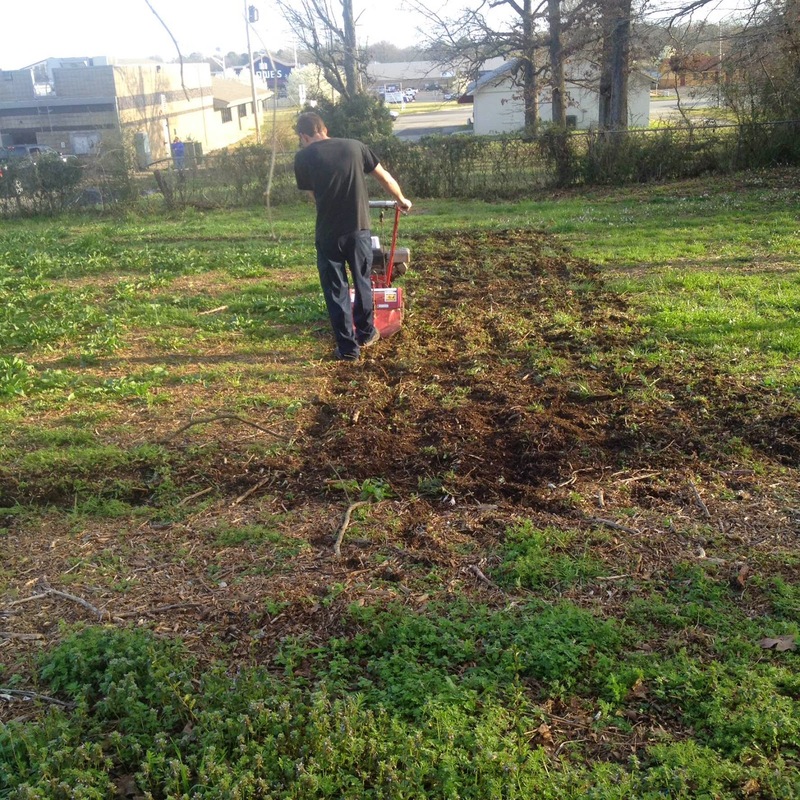 There are a few more places around town (the Faulkner County Day School, the Women's Shelter, the Bethlehem House) were myself and the other Gardencorps member in town are serving to start gardens, as well. It's been really great having such enthusiastic people to work with and seeing how the gardens are positively affecting their lives. My supervisor calls them therapy gardens and I can see why. One other pleasant update is I am now a contributor to the online farmers market here in Conway. 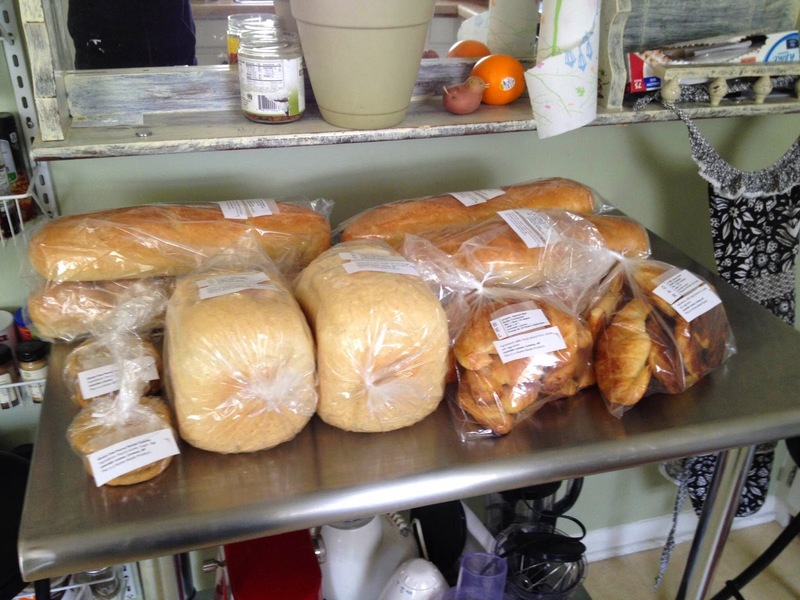 I'm selling sourdough breads, cookies, and coffee cakes at the moment. I've read that sourdough bread is easier to digest, even for those with mild gluten allergies, thanks to the active enzymes. I'm not positive as to the legitimacy of that claim, will have to do more research, but I do adore sourdough bread. Wayne and I started the sourdough starter back in September. After two or three failed attempts, we've managed to keep this one alive and in great condition. If you like baking bread, I definitely recommend trying sourdough breads! I definitely recommend starting your own garden this year, whether you have had one in the past or not. I've read several books lately touting just how much produce you can grow in small garden plots. I plan to extensively record my production this year so I can have a first hand account for you all. In the interim, I suggest visiting the Faulkner County Library, which has an extensive collection of books on gardening. My recent favorite is "Mini-Farming; Self-sufficiency on 1/4 Acre" by Brett Markham. He lays out the numbers for you and proves that you can replace one spouses income with farming on your own land. Considering how agricultural Arkansas is, I can imagine that this would be quite feasible for anyone who is interested. Especially if you really invest in the small things, like utilizing the free soil tests that the Ext. Services offers to find out what your soil needs to be at optimum nutrient levels. The results of this test even tell you organic options for correcting your soil. Wayne breaking ground on our large plot. I am greatly anticipating the results of my gardening efforts this year. This will be the largest scale I've grown on for my personal use. 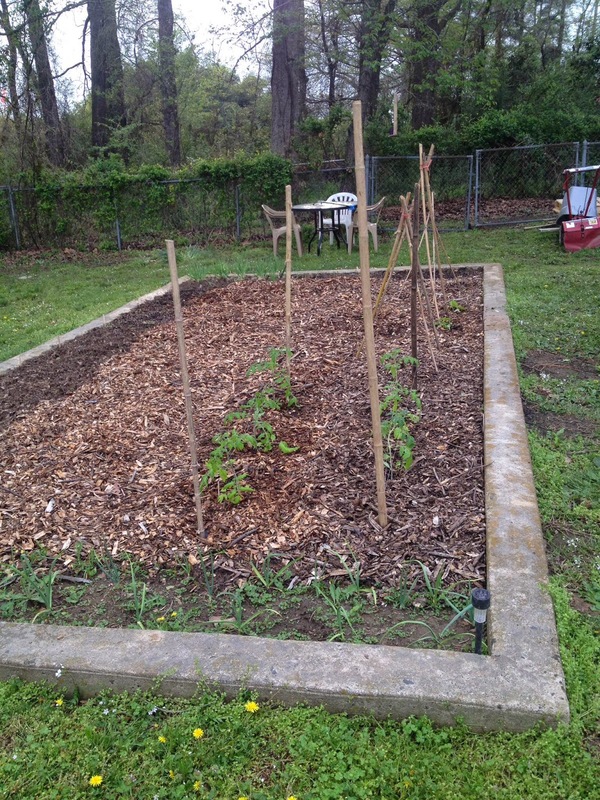 We have a 12ftx22ft raised bed in the backyard and a 37ftx34ft mini-farm on our second plot of land. Our landlords are very kind individuals and graciously bush-hogged this empty plot of land so that I could farm it. 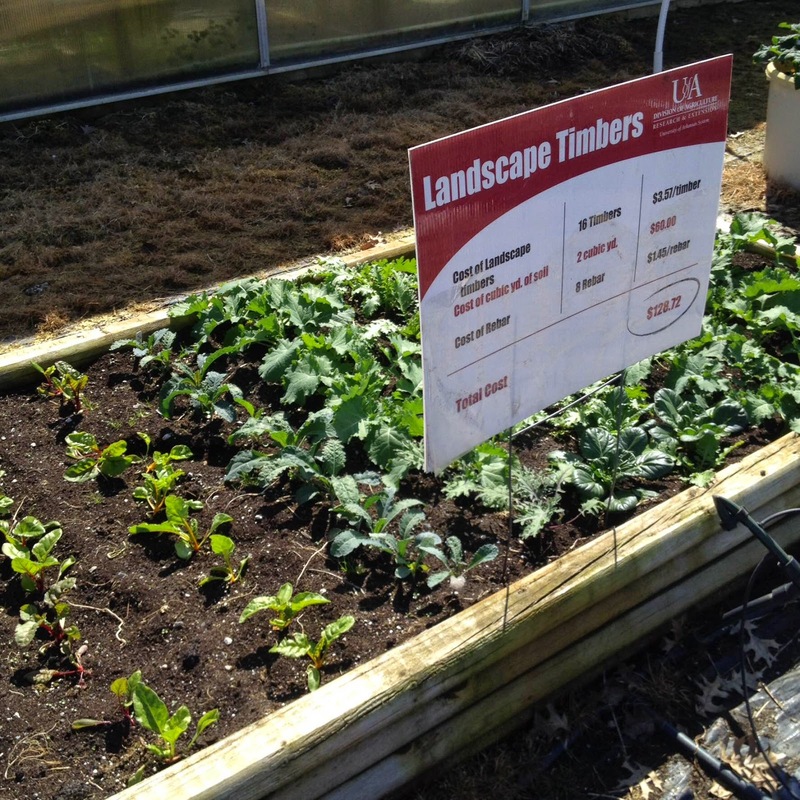 It went from a weed-infested plot to a beautiful section of raised beds. I cannot wait until the plants fill out and make the plot look well-used. Our raised backyard bed, so excited for garlic! One tomato plant can produce 10-15 pounds of fruit or more per season (currently only $3 for seedlings from CLG). A 10-ft row of beans produces about 5 pounds of fruit (trellising will help you save a lot of space!). A 10-ft row of cucumbers produces 8 to 10 pounds of fruit (trellising also necessary). A 10-ft row of lettuce produces 5 to 10 pounds (lettuce grows better in blocks though and can be grown closer together if you don't mind slightly smaller plants). A 10-ft row of peppers produces 2 to 8 pounds of fruit (in my experience, you can get much more than this). A 10-ft row of squash produces 20 to 80 pounds of fruit (if you can be diligent about killing those pesky squash bugs). I feel like these statistics are actually a little low for Arkansas conditions, but they are nonetheless encouraging. Think of all the money you can save by growing your own food. Plus, you will encourage the growth of the local wildlife, including birds and bees. The best part of growing your own food is the ability to pick the ripest fruits (the most nutritious) and know exactly what went into the growing process. If that's not something to feel good about, I don't know what is. One of the beds at the Teaching Garden. If you are interested in learning by hands-on experience, the Ext. office hosts gardening workshops at the Freyaldenhoven Greenhouses on Siebenmorgen every third Saturday of the month. Next Saturday the workshop is on starting your garden, so I would love to see some of you there! 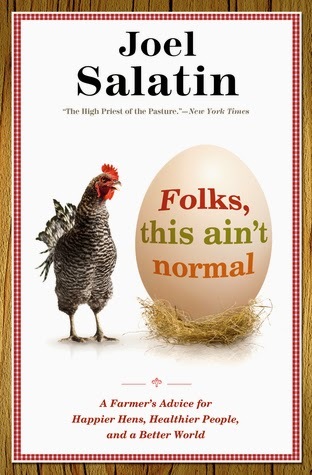 Recently I finished reading Joel Salatin's Folks, This Ain't Normal. Throughout the book he discusses a number of aspects of our lives that have moved far from what he considers normal (and to be fair, is historically normal). I have to hand it to him, he's done his research on the subjects he presents in the book. The essence of the book is that we have moved away from homesteading and sourcing locally, which is historically normal and a lot more ecologically sound. He also talks a lot about the struggles that small family farms face in a society that is driven by industrialism. Some of those struggles include the hardships they face in trying to work with certain restaurants. At the Southern Sustainable Agriculture Working Group (SSAWG) Conference, there was a session that discussed this very subject. The speakers mentioned that there are no laws that regulate a restaurant from buying produce directly from a farm. However, for some restaurants, the cook does not have control over where the ingredients come from. Some restaurants have contracts with distribution centers that restrain them from being able to accept foods from outside sources. As Salatin pointed out in his book, there are a huge number of hoops to jump through in order for a farm to add their produce to a distribution center's roster. This is due to most of the regulations being based on large-scale agriculture operations, which are more easily able to pay the high costs involved. For restaurants who do not have this type of contract, their ability to buy produce and meat from local producers is less limited. As the speakers at SSAWG mentioned, it often comes down to whether or not the chef is willing to put in the extra effort. The sad fact is that most chefs are not willing to put forth that effort or the extra cost to buy local. The same could be said of most citizens as well. It is rather fascinating that the current idea of normal imports food from so far away when Arkansas is an agricultural state. Being a southern state, we should be able to grow food year-round. From the looks of the recent weather, I'm sure there are many of you who are doubting the validity of that statement. The problem with growing all our own food is that we would have to revert to a seasonal diet. People as a whole are so used to the world market that many have lost sight of seasonality and the importance that it should play in the way we eat. Food grown in season is more nutritious and tastes better. Would you rather eat a tomato that was picked half ripe and ripened in a truck on it's 1500 mile journey to your grocery store (which Salatin points out is just another distribution center) or would you rather eat one that was picked at the height of ripeness in the field right outside of town? My preference definitely lies in fresh food, locally grown. Or food that was jarred at the height of its ripeness and preserved for lean months. Perhaps we are beyond the normality of sustainability, but I would like to keep hope that people like Joel Salatin or the farmers at SSAWG will continue to teach people so they can make an informed decision. Perhaps some day I will be able to assist in this goal as well by teaching people how to garden in their home spaces, no matter how small or large. Another point that Salatin makes in his book is that people always excuse themselves by saying they don't have time. His point is that if we take away people's televisions, how many hours would that add to their day? The excuse of having no time is really the excuse of priorities. If we took more time to care for the Earth, by gardening and cooking fresh foods, perhaps we would even be happier as a whole. I take pride in everything I accomplish with my own hands, be that building a chicken coop or picnic table out of recycled pallet wood, growing my own garden, or cooking any meal. It leaves me with a feeling of purpose, which is more than I can say for anything else I do with my time. Perhaps that is normal. This time last year, I requested a package of seeds from the Slow Food Ark of Taste as my Christmas gift. My mother happily obliged in this $15 gift. For those of you unfamiliar with the Ark of Taste, it is a collection of foods that are facing extinction. It might seem strange, the idea that foods are on the verge of extinction. However, if you look at our grocery stores, you will find that most of the foods grown for our consumption are of a small variety of breeds; those that are hardiest, easiest to grow, and (from many perspectives) the least flavorful. One of the Slow Food Movement's biggest projects is to advocate for people to begin growing endangered varieties of foods again in order to keep our flora systems diverse. The method of selling seeds from plants listed in the Ark of Taste is quite ingenious, if you ask me. Cannot wait to get these in my garden! So, this year, I perused the seed savers exchange to find endangered varieties that appealed to me and would grow well in my available space. I was very excited when all but my potato spuds came in the mail a few days later. I cannot wait to grow these plants, whose seeds I can then harvest and save for next year. Not a bad $40 investment, I'd say. I can't wait to share with you photos of their growth in my little plot. These oyster mushrooms have the faint scent of seafood. Today, I visited some friends of mine at Cedar Rock Ridge, one of the farmsteads that supply produce to Conway Locally Grown. Steve recently discovered that several trees in his yard are covered in oyster mushrooms and has been enjoying consuming their delightful spores. Since these mushrooms don't have a poisonous look-a-like, they are quite the treat to discover in the backyard. I was grateful that Steve allowed me to take a few home to try for myself. In exchange I took Carissa (his wife) some of my sourdough starter, which I've been needing to deplete so it will be healthier. I wish I knew someone who was schooled in foraging for mushrooms. I always read about this in books about French cuisine, but I've seen a few mentions of people in various states (mostly the Pacific Northwest) taking up foraging as well. I'm always afraid that I'm going to pick a poisonous mushroom and therefor have never gone foraging for them. If you know anyone who is an avid mushroom aficionado, please introduce us! My New Years Resolution for 2015 is to be more academic; to read more educational books, keep up with this blog (a great writing exercise, my goal is two posts per month), and put in to practice what I'm learning in the garden/kitchen. I actually finished reading a wonderfully inspiring book yesterday called Paradise Lot. The book is written by two gentleman, Eric Toensmeier and Jonathan Bates, who are very enthusiastic about plants; so much so, that they decide to turn an urban lot into a paradise. The transformation of their space is almost unbelievable. The practices that they are following are those of permaculture, a subject which I hope to learn more about over the next year. Overview of the Paradise Lot - taken from their blog. 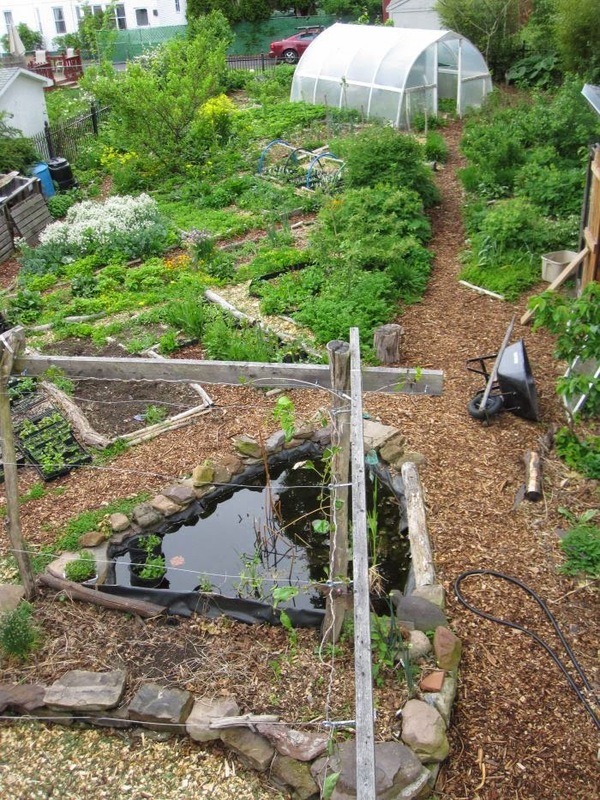 To give you an overview, the ideas of permaculture are based on growing patterns that are found in nature. These include planting polycultures (plants that grow symbiotically), planting three tiers of plants (tree height, bush/shrub height, and undergrowth), and making use of perennials (much better for building the soil and creating a stable ecosystem). For those who are especially eco-minded, permaculture is better suited to growing local plants with a few non-native varieties mixed in. This means a lot of strange plants that most people don't consume anymore. However, the idea intrigues me and I hope to some day implement similar practices here in Conway. Wayne found the book at the Faulkner County Library and it is an interesting read, but not a great reference for starting any similar work here. If you aren't into reading books, you can learn more about their practices from their blog, located here. The variety and types of plants they are able to grow in Massachusetts of all places is so inspiring! I can't wait to share with you the knowledge that I gain over the next year. Successes and failures alike will help us to build a better ecosystem in this growing urban environment. Come spring, give back to nature by planting a small garden. It could be in pots on your balcony or windowsill if you don't have much space. It could only consist of flowers. Any little bit helps us to reduce the carbon dioxide levels and give more nectar to our pollinator friends. If you have a larger space, maybe try building an insect hotel. There are designs available online for large ones and small ones. (I recommend reading up on them, they're a very cool space for beneficial insects to house themselves). My wish for you this year is to remember that everything on this planet is a give and take. So far, we humans have done a lot more taking and it's time for us to start giving back. Happy 2015! Shortly after my last post, I left the country for a three week trip to Japan and Germany. I returned home the day before I started my new position as an Arkansas Gardencorps service member with the North Little Rock Community Farm. I had hoped to get around to updating this blog before now, but it's been quite a busy four months for me. I do have some exciting news though! Other exciting news concerning the house is that my landlords are absolutely amazing. 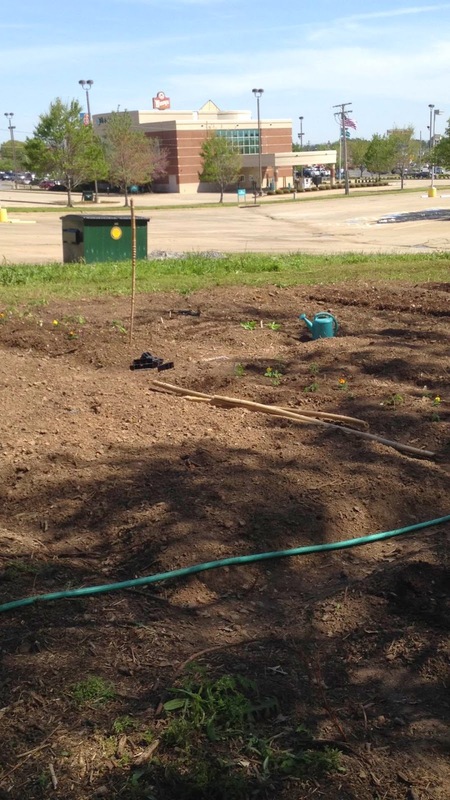 They own the plot behind our fenced in backyard and are willing to clear it and let me farm it so I can donate the produce to the school district's backpack program! So very pleased that the work I want my non-profit to focus on will begin in the coming Spring! Speaking of non-profits, I adore volunteering for Gardencorps. I get to be active on a daily basis and work outside (which is only unpleasant when it's freezing cold...any one else concerned with the unseasonable weather in November?). I work with high school students to make sure the Farm is kept in good running order. What I love about the Farm is that a majority of the food we produce is donated to the homeless and hungry students in the district. What an amazing use of space and resources! AND the whole concept was thought up by high school students! 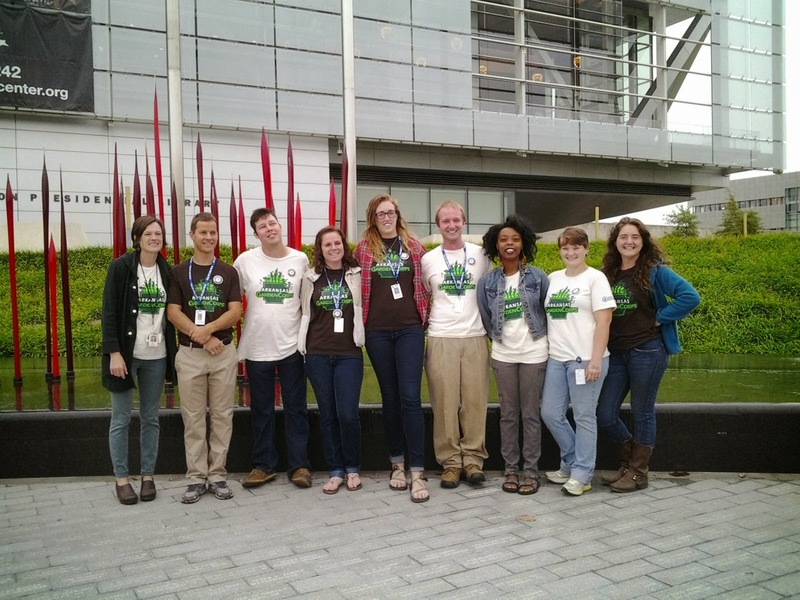 2014-2015 Gardencorps Members at the National Day of Service Recognition Ceremony. Other produce is sold to help care for the plethora of animals we are housing for educational purposes. Still more is used to introduce the students (middle and high school) to different vegetables, some of which they've never seen before. I understood the huge impact that the Farm can have on these students when one of my 9th grade volunteers was turning compost. She uncovered a decomposing eggplant and picked it up. She inquired, "Is this an eggplant, like the emoji?" I confirmed that it was and she told me that she had never seen a real eggplant before. I let her take one home and she was so excited about it that she wanted to plant her own. It is so disappointing that some people never get to know what certain vegetables look/feel/taste like. 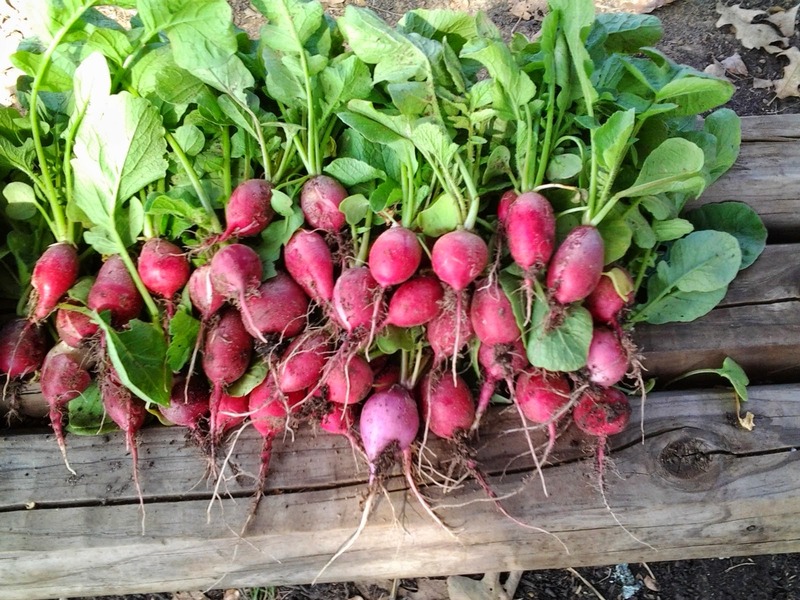 Gorgeous radishes grown on the farm. 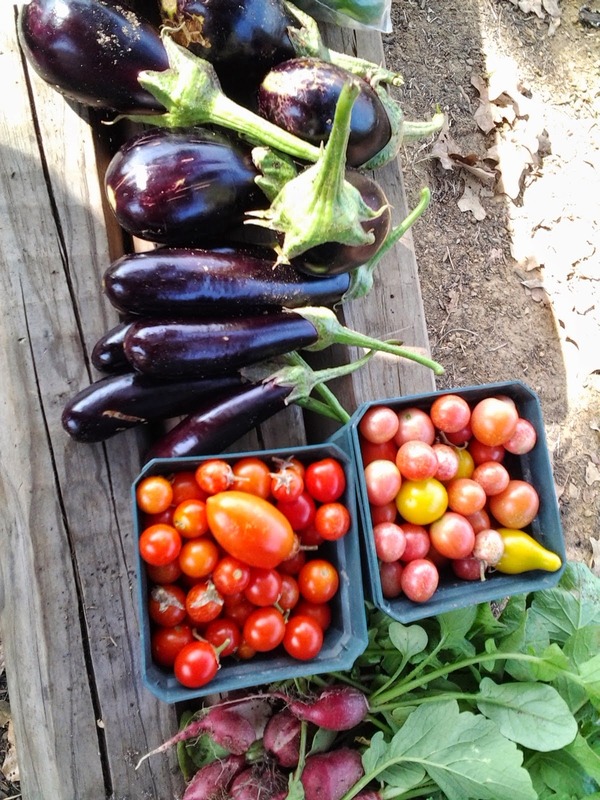 We've donated almost 500 lbs of produce from the NLR Community Farm since September! We have a lot of changes coming in the Spring at the Farm, starting with our first ever Farm Planning Meeting on Jan. 5th. Though I know this meeting is for North Little Rock community members and farm folks, I think it bodes well for surrounding areas like Conway and would be a cool event to attend if you have time. :) We especially appreciate anyone joining who has expertise in the Farm Management or Business Management areas. Hope everyone has a wonderful holiday! I look forward to keeping this blog up-to-date next year! 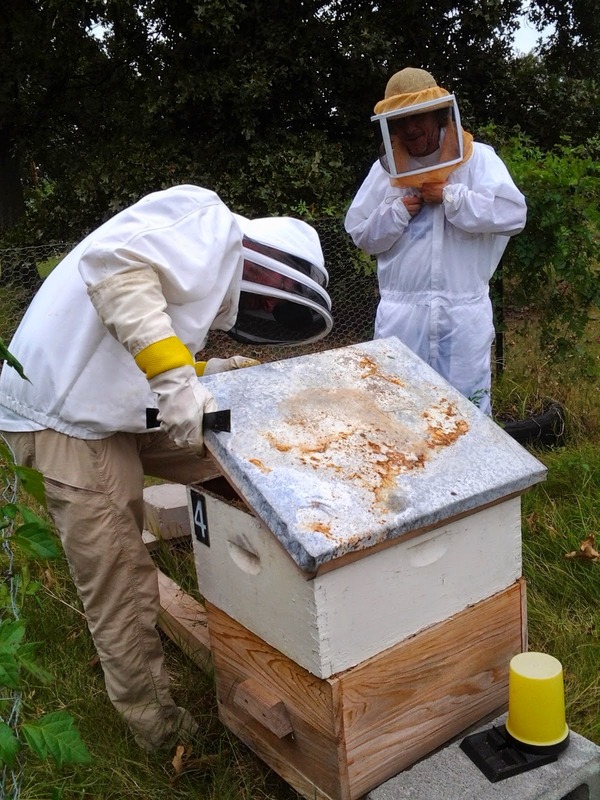 Did I mention we have bees?! I'm excited to learn more about them in the Spring!